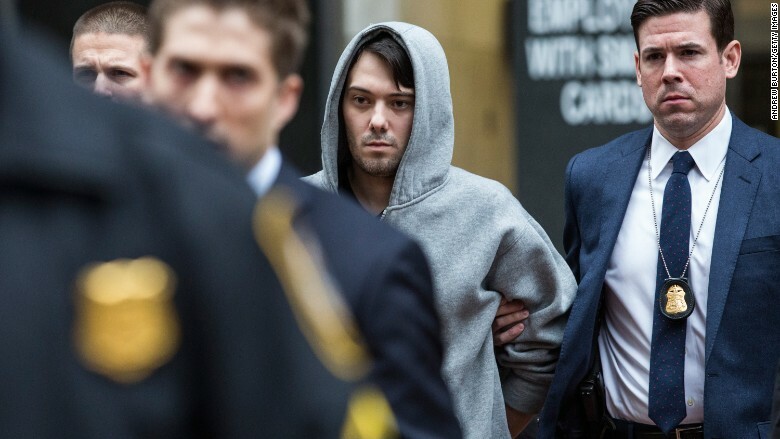 By now, you've probably heard of Martin Shkreli, the enigmatic pharmaceutical entrepreneur who was arrested in December 2015 for securities fraud. Shkreli was born in April, 1983. He grew up in Brooklyn. His parents are immigrants from Albania and Croatia. As a kid, Shkreli played chess with an older man named Marty who lived in his building and taught him about biotech stocks, according to an interview with CNNMoney in March. Shkreli bought shares of Compaq when he was 12 and Amazon when he was 15. -- When he was 16, Shkreli dropped out of the prestigious Hunter high school in New York. -- He interned for Cramer, Berkowitz & Co., founded by CNBC's "Mad Money" host Jim Cramer (Cramer had left his namesake hedge fund by then). -- Shkreli's first run-in with the law took place in 2000. He told Cramer's fund to short a biotechnology stock, according to an interview with Bloomberg. Sure enough, the stock fell, and Cramer's fund profited. Shkreli was investigated by the SEC for the well-timed bet, but ultimately cleared of any wrongdoing. He received a business degree from New York's Baruch College in 2004 and later worked at UBS and Intrepid Capital Management. He founded a hedge fund called MSMB Capital Management. He made a name for himself by shorting biotech stocks and berating those companies on social media. -- In February 2011, Shkreli founded Retrophin, a pharmaceutical company. -- That same month, Shkreli made a really bad bet shorting a biotech company called Orexigen Therapeutics. He lost $7 million for his hedge fund. He suffered $1 million in other trading losses too. With under $60,000 of assets left, MSMB halted all trading. -- Shkreli continued to send investors progress reports about MSMB Capital as if the company were still a healthy company, according to federal prosecutors in an indictment in December. -- Federal prosecutors say that between February 2011 and September 2014, Shkreli and an associate funneled money out of Retrophin to pay off debts owed by MSMB and by Shkreli, personally. -- In December 2012, Shkreli made a series of fake, backdated transactions to make it look like MSMB Capital had invested in Retrophin, the FBI says. -- Forbes named Shkreli to its "30 under 30" in finance list. -- Retrophin investors began to catch on, and seven demanded money from Shkreli. Between February 2013 and March 2014, Shkreli forced Retrophin to settle with the investors for $11 million, but he didn't ask the board's approval, according to the prosecutors. -- In August 2013, Retrophin's auditor questioned the settlements, determining that they weren't the company's responsibility. Yet Shkreli continued the settlements, which he disguised from the auditor in the form of sham "consulting" agreements. Retrophin's board voted Shkreli out as CEO in September 2014. Shkreli said on Twitter that the directors were "insane." -- Shkreli formed Turing Pharmaceuticals in February 2015, which bought the rights to market Daraprim, a toxoplasmosis treatment used by AIDS patients. -- In August 2015, Retrophin sued Shkreli for $65 million, saying he used the company's assets to pay off hedge fund investors. -- Turing caught fire in September for hiking the price of Daraprim. A single pill, which had cost $13, was raised 5,000% to $750. -- The Daily Beast named Shkreli the "Most hated man in America." He vigorously defended the price hike, claiming that his company needed to profit from the drug. He also said that everyone who needs it would be able to afford Daraprim. -- In October, Shkreli made a $2,700 donation to Bernie Sanders' campaign. Sanders rejected the donation, sending the money to an HIV clinic. -- Shkreli went on several rage-filled Twitter rants in October, mostly aimed at Sanders and CNBC. CNBC primetime viewership: 226,000. lol. 90% are muted TVs in hedge fund offices. -- In November 2015, Shkreli bought KaloBios Pharmaceuticals. The company owned the rights to a drug called Benznidazole, which is used to treat Chagas disease. Shkreli said that KaloBios is planning to raise the price of the drug once the treatment receives approval from the FDA. -- Shares of KaloBios soared 400% after Shkreli bought the company. -- That same month, Turing cut the price of Daraprim by half for hospitals. -- The U.S. Senate Special Committee on Aging opened an investigation of Turing in November. -- Shkreli began live-streaming his life on YouTube for hours at a time in November. He chatted with his audience, often defending his actions. -- In December, Shkreli announced that he was the mysterious buyer of the Wu-Tang Clan's newest album, "Once Upon a Time in Shaolin." The rap group had released just one copy of its album, putting it up for auction. Shkreli paid $2 million for it. -- That same month, Shkreli announced that he wanted to bail out jailed rapper Bobby Shmurda, who also grew up in Brooklyn. 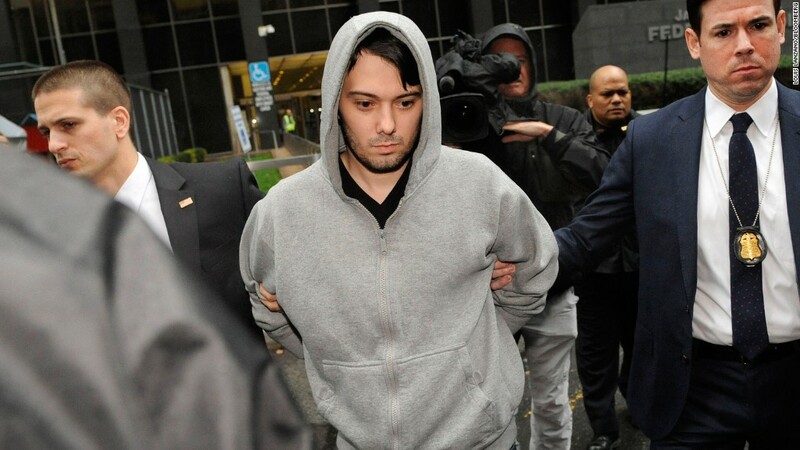 -- Shkreli was arrested in December for securities fraud. His lawyer said Shkreli "strongly denies the charges," and posted $5 million in bail. -- Shkreli officially stepped down as CEO of Turing. Afterward, he took to YouTube and live streamed himself for nearly five hours. -- Shares of KaloBios (KBIO) plummeted 50% following his arrest, and trading was halted all day. -- On Twitter Shkreli proclaimed his innocence, saying, "I am confident I will prevail." -- Shkreli was fired from KaloBios in December -- it's the third time he's been booted from a CEO job. KaloBios eventually filed for bankruptcy. -- In January, it was revealed that Shkreli used a $45 million E*Trade account to secure his bail. -- On January 19, Shkreli filed a petition to replace his attorneys and asked for a two-week delay to prepare for his criminal trial. -- On January 20, he tweeted that he had been subpoenaed to appear before a House oversight committee. Shkreli said he would plead the fifth. Heather Long contributed to this report.